Gasoline is a toxic substance, which has numerous health and environmental effects that are less than desirable. Exposed to the atmosphere, gasoline would evaporate and pollute the air. To prevent your vehicle from causing undue air pollution, the entire fuel system, from the gas gap to the fuel injectors, is sealed. Still, faulty vehicle fuel storage systems may account for up to 20% of overall vehicle emissions! During normal operation, such as running the engine (pulling fuel out of the tank) or refueling (putting fuel in the tank), a perfectly sealed system wouldn’t work very well. 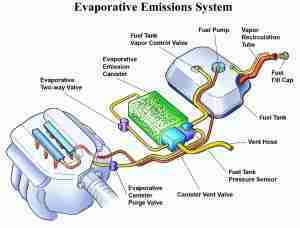 The function of the evaporative emissions control system, typically referred to as the EVAP system, is to store and route fuel vapors from the tank to the engine, without allowing them to escape into the atmosphere. Apart from the fuel tank and gas cap, the EVAP system typically consists of valves, pressure sensors, flow sensors, a canister of activated carbon, and tubing from the tank to the engine. Some vehicles use a vacuum pump for engine-off EVAP system testing. Depending on specific operating conditions, the engine control unit (ECU) opens and closes valves to route fuel vapors to the engine, where they are burned. At other times, depending on the vehicle, the ECM will test the EVAP system to make sure it is sealed from the atmosphere. 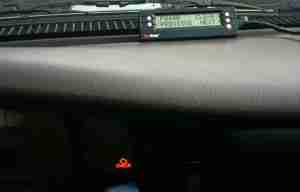 If the ECU detects a fault in the EVAP system, it will set a DTC (Diagnostic Trouble Code) and illuminate the MIL (Malfunction Indicator Lamp). Specifically, DTC P0455 refers to the ECM having detected a large leak in the EVAP system, and it may be accompanied by similar leak codes, such as P0442, P0456, or P0457, or perhaps a general EVAP system fault code, P0440. EVAP problems don’t typically manifest themselves as drivability problems. Depending on year, make, and model, DTC P0455 may have number of causes. Here are some of the most common. Loose or Missing Gas Cap – This is, by far, the most common cause of EVAP system leak codes, such as P0455, P0442, P0456, or P0457. 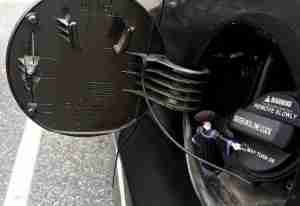 Install and tighten the gas cap after every refueling. Refueling with Engine Running – You should always shut down the engine when refueling, and not only for safety reasons. If the EVAP system leak monitor runs while the engine is idling, with the fuel cap off, it will detect a leak and set a DTC. Faulty Gas Cap or Gas Cap Seal – If the gas cap is worn out, or the seal is cracked, it will not seal properly. Similarly, some EVAP systems are more sensitive, and a non-factory gas cap, even if it’s the right type, may not seal properly. Stuck Valve – At least two solenoid valves open and close the EVAP system to route fuel vapors to the engine. Corrosion or debris may hold a valve open, and it will register as a leak. Nissan / Infiniti – Vent Control Valve stuck open – Located near the charcoal canister, the valve is highly susceptible to corrosion and debris. Updated valves or an auxiliary filter kit are available for some models. Hyundai, Mazda, Volkswagen – Purge Valve stuck open – Again, these valves are highly susceptible to corrosion and debris. Older Vehicles – Over time, plastic and rubber tends to become more brittle and less flexible. 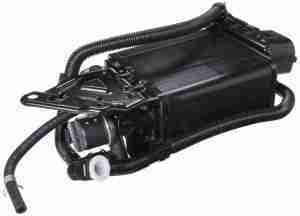 Plastic parts and rubber hoses may crack, resulting in poor EVAP system sealing. A smoke test might be necessary to identify less-than-obvious cracks. How do you troubleshoot code P0455? As always, you should always start diagnostics with reading the code and considering your last few days of vehicle operation. The first thing you should check, in case of DTC P0455 or similar codes, is the gas cap. The gas cap is actually more complicated than it seems, consisting of a sealing ring, torque limiter, and perhaps a one-way valve. The rest of the system, including the tank, charcoal canister, and EVAP lines, can be more difficult to assess, unless you spot some obvious damage. Is the gas cap installed properly? Depending on design, the gas cap may need to click once or a few times, which activates the torque limiter to ensure a proper seal. Is the gas cap in good condition? Check the sealing ring for breaks, dents, or dry rot. Similarly, check the gas tank inlet for rust or damage. Any of these conditions could lead to a bad seal. Double check the torque limiter to see if it seems to work. If the top spins freely, it likely isn’t torqueing the seal properly. Look for any obvious damage that would compromise the seal. Some parts of the EVAP system are exposed under the car, and road debris or off-road action can easily damage the canister or exposed EVAP tubing. Have you had any work done under the hood? Even something as simple as an engine air filter replacement may have unintentionally dislodged an EVAP system hose. 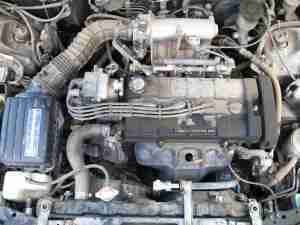 Other more intensive work, such as spark plug replacement, may have required EVAP component removal for access. Make sure everything is installed properly afterwards, including plugging in the EVAP Vent Valve. Follow your nose – Under the hood, you shouldn’t smell fuel, but if you’re careful, your nose might point you right at the leak. Barring any obvious EVAP system leaks, further diagnosis may be impossible without specialized equipment. One such tool is a smoke machine, typically used in conjunction with an ultraviolet lamp. The smoke machine pumps a fine mist into the EVAP system under low pressure. A careful inspection of the system should reveal where the mist is escaping from. Jumper Wires – Disconnect the valve and apply battery voltage across the terminals. You should hear an audible “click” as the valve opens and closes. Vacuum Pump – Disconnect the hoses from the valve and use a hand-pump to apply vacuum to one of the ports. With the valve de-energized, it should hold vacuum for at least two minutes. When it comes to diagnosing EVAP system leak codes, such as P0455, P0442, P0456, or P0457, and sometimes it may be as obvious as a loose gas cap, but it won’t always be such an easy fix. Take your time and be thorough, and soon you’ll have your car running right, reducing emissions at the same time. On a 2014 Buick Enclave is it possible a normal EVAP leak test is being run about 12 hours after car is turned off. I’m getting an occasional noise from my garage that I can’t figure out what it is. Great job, Benjamin. Thank you. I have a 2012 Mustang and I keep getting the P0455 code and it seems to happen after I hit a rough patch in the road. Any ideas? Reset and it stays off until I hit a bumpy road.